This medical thriller captivated me from the start, with fascinating, thought-provoking descriptions of an anesthesiologist’s role in the operating room. Author Carol Cassella, a practicing anesthesiologist herself, has created an absorbing story that starts with the tragic death of an 8-year old girl who dies during surgery. The story line focuses on the personal and legal effects on the anesthesiologist who is held responsible for her death. 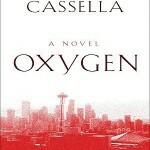 Oxygen contains a great combination of twists and turns, as well as issues involving love, family, reconciliation, and betrayal.